Rio, the cross-breed dog rescued from the streets of Pelham, is recovering well and already has a possible home with a new family waiting for him. 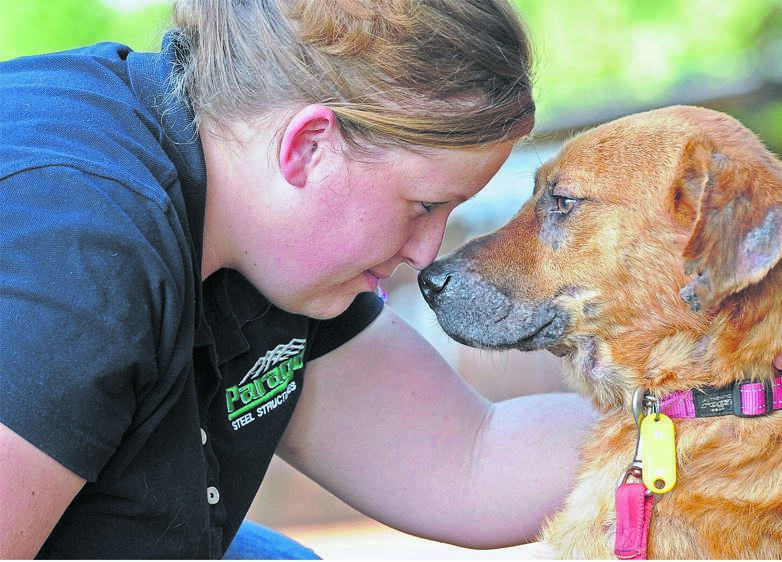 Tina Clarke, one of the founders of PMB Animal Rescue & Rehome which rescued the dog, said Rio had become a very famous pooch in the Pelham community after he was first sighted last week walking around the area in a very poor condition. He was then spotted more often, with locals announcing it on Facebook and the community WhatsApp group, but each time one of their volunteers went to search for him, he would be gone. “His rescue lasted days, with volunteers rushing off to where he was sighted throughout the course of the day, every day. “Our volunteers had their lucky break when he was spotted walking in York Avenue on Tuesday morning. “Residents rushed to search for him and found him rummaging through trash in Jesmond Road. “They tried to catch him, but he disappeared again. It was thanks to the quick thinking of Peter West that Rio was then found collapsed in a bush. “He notified the volunteers and residents and with the combined efforts from Chantel Oosthuizen and Michael Smith, they managed to secure Rio,” said Clarke. She said they managed to lure him out with cheeseburgers that volunteer Erica Neethling rushed over with and as a team, they succeeded in rescuing him. Local animal lover Maureen Vida, who was with the PARR team when Rio was rescued last week, said it was heart-warming to see how many people stopped to help on the day he was captured. “The whole Pelham community, on their WhatsApp group, have been following his movements for weeks. He became quite a celebrity,” said Vida. Rio was rushed to Chase Valley Veterinary Clinic where he was sedated and his skin treated. Clark said Rio has been doing well with his treatment for pyoderma, a skin infection, and that his skin was no longer bleeding. She said he is looking and feeling much better. He was discharged from the clinic on Monday and is currently being kept at boarding kennels for the remainder of his quarantine period. He will be assessed with other dogs, cats and children before being placed in his foster home. Clarke said Rio already had a possible home. Clarke went on to thank everyone who donated towards Rio’s treatment and boarding and all those who helped with his rescue. Janet Smith Hicks said: “When I saw him going past my house and I tried to call him he reminded me so much of the childhood programme called Boomer.